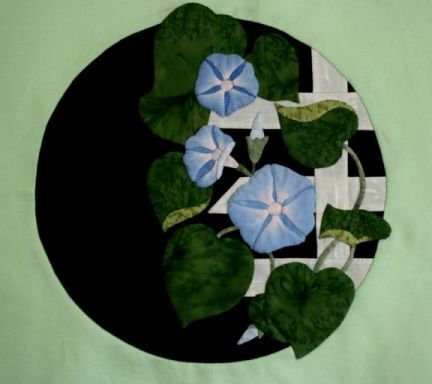 At Artfully Applique, we offer original applique designs, patterns and kits. All samples are made using traditional needle turn applique. From the flower applique patterns, to ones featuring wildlife, these elegant applique designs can be a welcome addition to any quilt. Made with quality and care, all of the applique patterns on our site are designed personally, with our customers in mind. Our applique kits are specifically created for beginners and experts alike, allowing you to develop or better your applique skills. YOU DO NOT ENTER ANY OF YOUR FINANCIAL/SECURE-TYPE INFORMATION ON THIS WEBSITE! After you have made your choices - as in put into your 'cart' - you are directed to PayPal for the actual payment process. I DO NOT HAVE ACCESS TO ANYTHING EXCEPT YOUR NAME AND SHIPPING ADDRESS. For free hand applique' pattern tips see link near bottom of this page. I recently added a second page with some details for actually doing the applique stitch. And Tammy did her magic with dye so I could make them look as real as possible. These were drawn from photos of my tree - which, I'm sad to say, did not make it thru the drought! So - here it is "forever" ^_^ You will find it in "Favorite Flowers" Just a note: I have changed the overlay and it is now dark brown. I think it makes the flowers stand out much better. I could almost call this a miracle. For those who have been in one of my classes, it is the answer to your requests. It is the class in written form and as a kind of 'workbook'. The pattern is included - the same one I use in classes. It is not glitzy or fancy. It is self-published and bound so that you can lay it flat if you want to look at pictures and/or read while you are stitching. If you have not taken the class, I say it is a great tool for anyone - either to learn how, or to improve, with regard to hand, needle turn applique. If you find the tips and blog useful, why not just go for (as Dr. Dyer would say) "The Whole Enchilada" and buy the book?! It's all in there - plus way more! And now there are 3 that can be used together! Click on Favorite Flowers in tabs at top. If you choose to do them like this, you might want to make those horizontal pieces of trellis for the Sweet Pea extend all the way across so it looks like one trellis??? The 3 patterns are available in one package if you choose. The package is on the Favorite Flowers, page 2. You must click on "More Info" to see the picture. And now there is another set of three available at a reduced price. And for a Spring Special, even less! You will find it on the second page of Favorite Flowers!! High Sierra Quilters - that's the place to come for a class from me!! Right here in Placerville! They are in the same little strip mall as $$ Store and Grocery Outlet - that's on the East side of town, (heading East) get off Hwy 50 at Schnell School Rd., turn right at end of ramp and left at the 3-way stop just a few yards away. It's about in the middle, between Grocery Outlet and $ Store (at 1444 Broadway). Sooo, if you have been wanting to take a class from me - we can now do that even it it's only you. Give them a call! 530-622-9990 to request class schedule or an applique class for yourself! Cost is $35; pattern included; optional kit for $5 You can pick a day just for you. ^_^ While there is not a class currently scheduled, I am happy to do a one-on-one. Just give me a call (or email works also) and we can get it set up! Any blogging quilters out there? (sounds a little obscene ^_^) Love to hear from you! Just click below here - it will take you to a very useful post. How to do skinny applique stems!